EndeavorIQ – unleashing your financial potential. Video based learning on strategies to increase profitability. What is your business worth ? Use this calculator from Money and Fortune Magazine to determine your company’s possible value. What’s a multiple ? Read up on the basics of valuation. How to Think About Succession Planning Succession planning is something every business owner must face at some point in the life cycle of their business. It’s a process that can be complex and one that all too many business owners tend to put off until it’s imminent. Podcast #1: Why Don’t My People Manage ? Podcast #3: I’ve Got a Board But it’s Become Frustrating to Manage. Now What ? Lorraine and Rob have been a valuable resource to my team. Their expertise has allowed our organization to move forward in many positive ways. Their approach to strategic planning is more practical and when combined with their leadership training, helped me build the blueprint for our seniors housing portfolio." I've just completed selling my business. 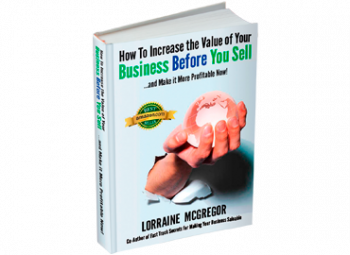 How I wish I had found "How to Increase the Value of Your Business BEFORE You Sell... and Make it More Profitable Now!" I would be in a lot different position than I am now. How come advisors don't tell you this while they are busy preparing the financial statements and the legal documents for the sale? That’s what I want to know!! After reading Lorraine and Rob McGregor's how-to books I now appreciate the big picture of what it takes to have a successful business, defined by my values, needs and desires. Their coaching and strategies make my business as profitable as it can be and I realize this investment will help maximize my return should I want to sell my business one day." C. Esther De Wolde CGA CEO, Phantom Mfg. (Int’l) Ltd.
We chose to start working with Rob and Lorraine after getting a strong recommendation from a close friend. I really value the wealth of experience they bring to the table from leadership to strategy to how to turn our company into a valuable asset. Working with Rob and his techniques will bring your working relationships to a new level. 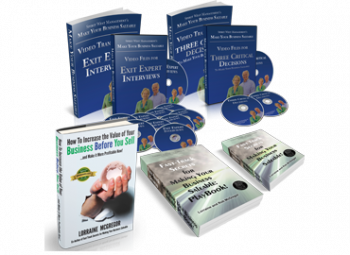 There are hundreds of great books and programs about building a business. But none about preparing your business for sale... until now. 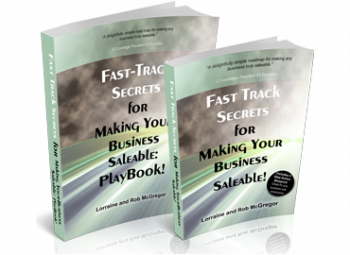 Fast Track Secrets for Making Your Business Saleable gives you a clear blueprint and step-by-step plan of action for preparing and selling your business without losing your shirt (or your mind) in the process. A must have for any business owner planning to sell their business. Don’t go to the bargaining table without it. Having owned several businesses over the years, I always wondered why I couldn’t get more out of them while I owned them or when I sold them. The value was always there, I just didn’t know how to maximize it. Thanks to the McGregors, now I do. Spirit West Management's approach helped me gain better insight into myself with their powerful tools and coaching skills to change my approach from that of a manager to that of an influential leader with my teams and my board. My time is now impactful. I found out from Rob that my approach was causing me a lot of stress. It took awhile for me to see it, but now I know how to mentor our people and make the change stick. Their decisions are way better which is what turned around our profitability. Spirit West offers solutions that include coaching, education and strategic consulting to jumpstart your transformation to be a happier, hassle-free, profit driven enterprise. We recognize these 4 fundamental steps forge your success. is synonymous with becoming yourself. and it is also that difficult.